Welcome to Norris Lake located in the Norris Highlands, where water related recreational opportunities await in one of the TVA's cleanest lakes. 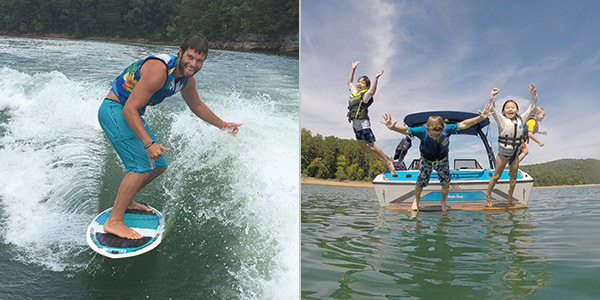 Whether you come for boating, fishing, skiing, golfing, 4-wheeling or just relaxing, we feel that the area has it all, making Norris Lake your family vacation destination. 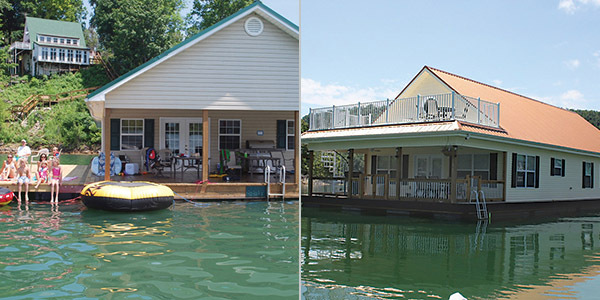 Over 20 marinas on the lake offer a variety of accommodations from hotels, condos, homes and campgrounds on the lake to mobile houseboats and float houses on the lake. 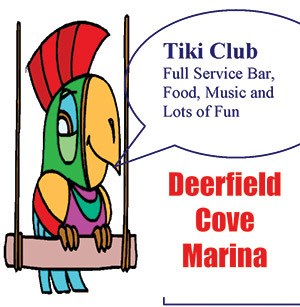 Most of the marinas offer ski boat, fishing boat, pontoon boat, party barge and jet ski rentals, restaurants on the lake overlooking the lake with theme parties and special events throughout the year, along with some of the most friendly and helpful people around. 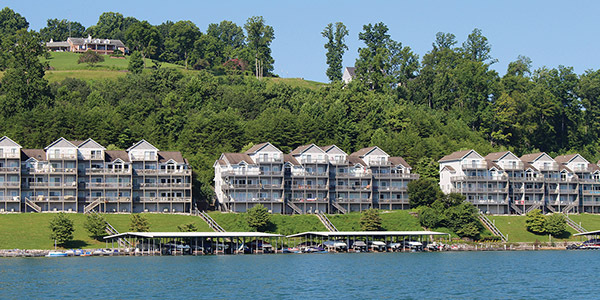 Our marina association takes great pride in Norris Lake being one of the cleanest lakes in North America and continues to work together with the Tennessee Valley Authority (TVA) to keep it that way. As a result, more than half the marinas on the lake have been certified by the TVA as clean marinas. 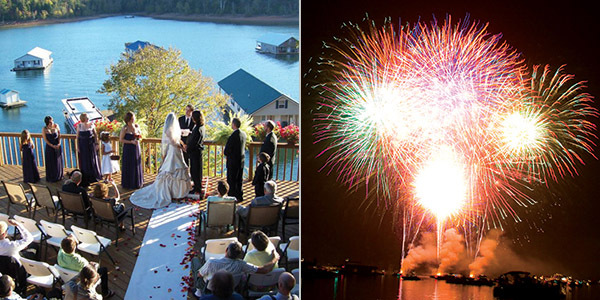 We have designed this web site with information on Norris Lake marinas, resorts and other companies to assist you in planning your next trip. We look forward to seeing you on the lake. Nestled in the foothills of the Cumberland Mountains, about 20 miles north of Knoxville just off I-75, is Norris Lake. Well known for its fishing, skiing and boating on its deep clean waters, the lake consists of two major rivers and numerous creeks. 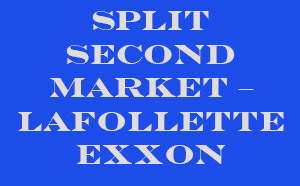 It extends 56 miles up the Powell River and 73 miles into the Clinch River. Since the lake is not fed by another major dam the water is cleaner and once the sun begins to warm the water in late May, it tends to maintain a steady warm temperature until fall. 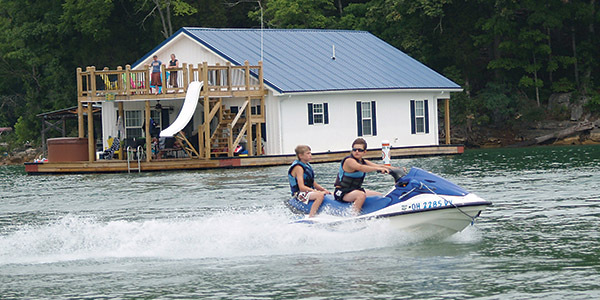 Recreational use of Norris Lake exceeds that of any other TVA tributary lake. At normal summer pool, with the lake level at 1020 (sea level), there are over 34,000 acres of water. 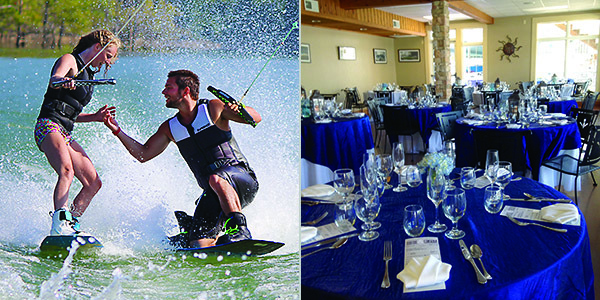 Endless fun-filled activities await you; including boating, water sports, fishing, swimming, scuba diving and relaxing. 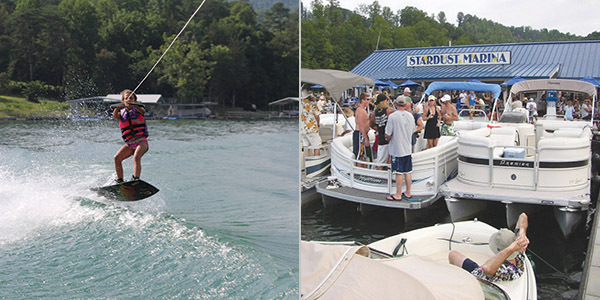 Norris Lake has over 56 species of fish and is well known for its striper fishing. Along the 809 miles of shoreline many more activities can be enjoyed like golfing, hiking, horseback riding, rock climbing and camping. 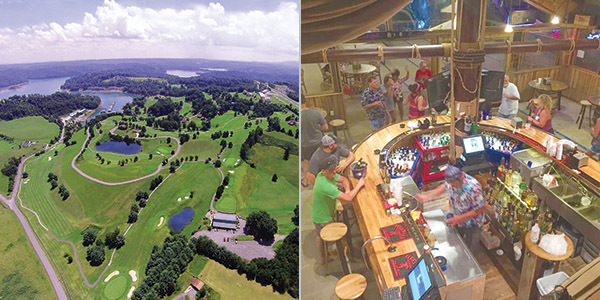 With hundreds of secluded coves, 3 state parks, two wildlife management areas and 59 public access sites, it’s no wonder Norris Lake has become a favorite vacation destination. The shoreline includes over 50 miles of islands, numerous picnic areas, caves, cliffs, beaches and gradual sloping shorelines. An abundance of wildlife can be spotted including deer, turkey, great blue herons and a few eagles along with cows and horses grazing at the shoreline. 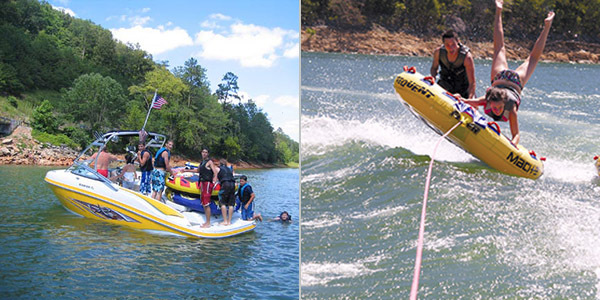 There truly is something for everyone at Norris Lake, so get your family and friends together and plan your trip today! Norris Lake extends into five counties: Anderson, Campbell, Claiborne, Grainger, and Union. The Clinch River is 300 miles long and drains an area of 2,912 square miles. Its major tributary, the Powell River, drains 938 square miles and is about180 miles long. There are approximately 27,927 acres of Norris Reservoir shore land on which TVA can plan future uses. 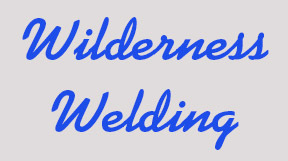 Of the 809 miles of total shoreline, 16 percent is privately owned flowage easement land, 42 percent is owned and managed by TVA, 26 percent is owned by TVA and jointly managed (Wildlife Management Areas and Parks) and 16 percent is TVA-owned residential access shore land. Norris Dam, the first project built by the Tennessee Valley Authority (TVA), was started in 1933. Named for George W. Norris, a U. S. Senator from Nebraska who was the author of the legislation that created the TVA, the dam was complete in 1936 and the lake was filled by 1937. At 265 feet tall and 1,860 feet long, Norris Dam provides flood control, recreation, generates hydroelectricity and helps improve navigation of the Tennessee River. 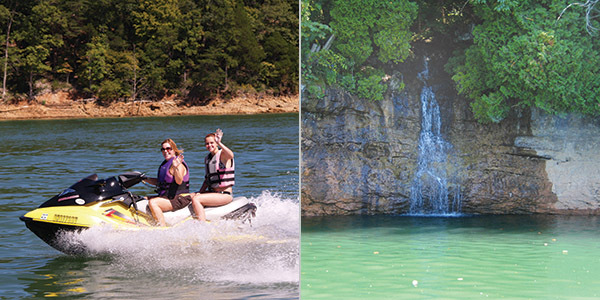 The waters of Norris Lake reach over 800 miles of shoreline including dozens of islands. When the lake drops about 32 feet in the winter even more islands appear. With a surface area of more than 34,000 acres and depths over 200 feet, Norris Lake holds about830 billion gallons of water and that water is put to good use. The dam has two turbine hydroelectric generators that can produce up to 100,800 kilowatts of electric. It is the first dam in the TVA's flood control system with the spill waters eventually flowing into the Ohio River. Norris Dam State Park surrounds the dam with many facilities and activities including hiking trails, playgrounds, tennis courts, swimming pool and recreational programs. 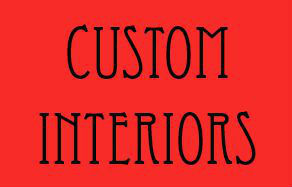 Campgrounds, picnic area sand cabin rentals are also available. There is a visitor’s center on one side of the dam and an overlook on the other side that provides a great vista for photographs of both the lake and the spill waters. A picnic area can be found at the base of the dam. The Norris Dam Area encompasses the Clinch River from the Norris Lake dam to the Anderson County Park along with Big Creek and Cove Creek. At the dam the Lighthouse Marina overlooks the dam waters where Cove Creek meets the Clinch River. Cove Creek flows from the Cove Lake State Park towards the dam. Along Cove Creek there are two marinas, Twin Cove Marina and Mountain Lake Marina. The Norris Dam State Park and the Cove Creek Wildlife area border Cove Creek where it meets the Clinch. Norris Lake State Park also borders the Clinch River on one side up past Big Creek before you get to Sequoyah Marina. Big Creek Flows from the Campbell County Park just outside of Lafollette. Indian River Marina and Whitman Hollow Marina are both located on Big Creek.